New anaerobic products for inactive and passive surfaces! 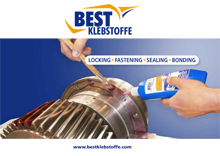 Anaerobic adhesives – innovative products – not classified! BEST-thread lockers – efficient and cost-effective!